《安娘喂 俱樂部》Anh Yeu Em Club 已經停播! 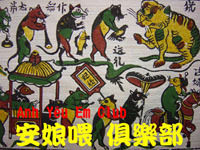 Welcome to Anh Yeu Em Club, Abuna's (Taiffalo's) Internet broadcasting program! It's the first program introducing Vietnamese culture to global audience in Taiwanese (occasionally bilingual with Vietnamese, Mandarin Chinese or English). How? You just need to click on Taiwan Channel if you have already installed Winamp or Realplayer, otherwise, you need to install either one of the software.